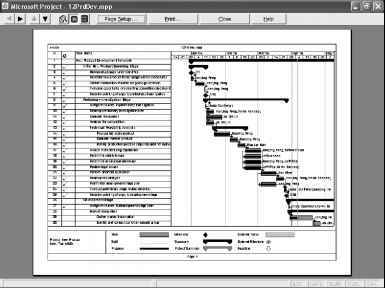 Suppose that you've been tracking and managing your project for some time now by using the Gantt Chart, the Resource Sheet, and other Microsoft Project views. You can set up one of these views to contain exactly the fields of information you need and then print it to create a kind of report. By printing views, you can share pertinent information with team members and stakeholders. 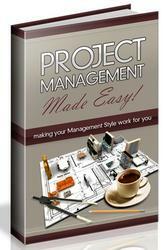 You can include printed views in project status reports and in progress meetings. Note Form views, such as the Task Form or Resource Form, cannot be printed. Neither can combination (split-screen) views. You can print one part of a split screen at a time, but if one part of the split screen is a form (such as Task Entry), it cannot be printed. To set up and print a view, follow these steps: 1 Open the view and arrange the data as you want it to appear when printed. For more information about available views, and arranging information on those views, see Chapter 4, "Viewing Project Information." 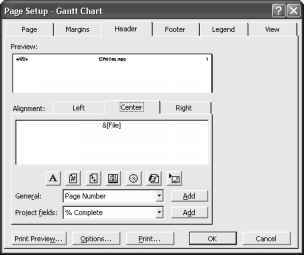 2 Click File, Page Setup to display the Page Setup dialog box (see Figure 12-1). Figure 12-1. Use the Page Setup dialog box to set your margins, legend, headers, and more. 3 You can adjust the view orientation, page scaling, margins, header and footer, and so o on. When finished, click OK.
4 On the Standard toolbar, click Print Preview. A picture of the view as printed appears, reflecting your Page Setup options (see Figure 12-2). Figure 12-2. The Print Preview window shows the printable layout of the current view. 5 To make further adjustments to the print options, click Page Setup at the top of the Print Preview window. 6 To make further adjustments to the view itself, click Close on the Print Preview toolbar and work in the view. 7 When finished with your adjustments, print the view by clicking Print on the Standard toolbar.